I almost didn't get around to decorating my tea trolley for Easter this year, but on Saturday, I was inspired by a vintage embroidered table runner I'd come across. I'm trying to give away, donate, or toss a lot of the linens that I've let accumulate but don't use very often, yet something about this piece speaks to me. 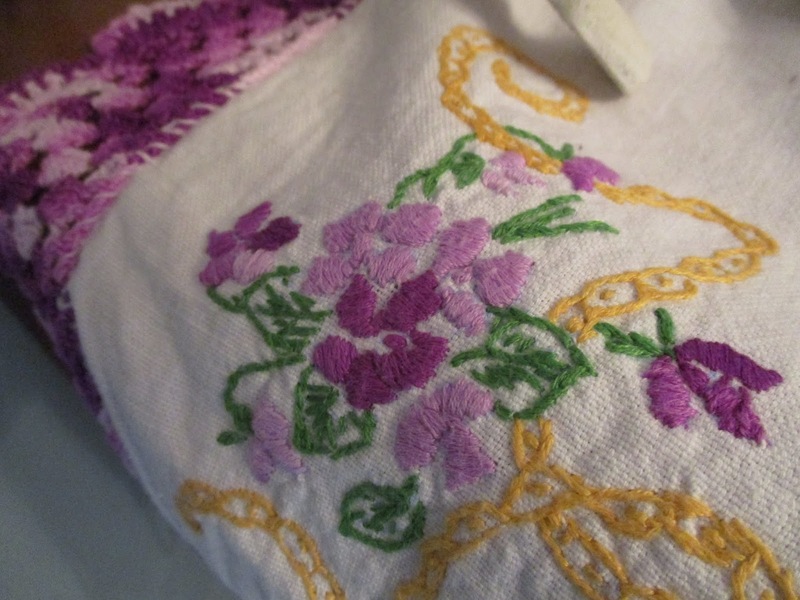 I'm not sure, but I believe it was in a pile of assorted linens my late mother gave me years ago. 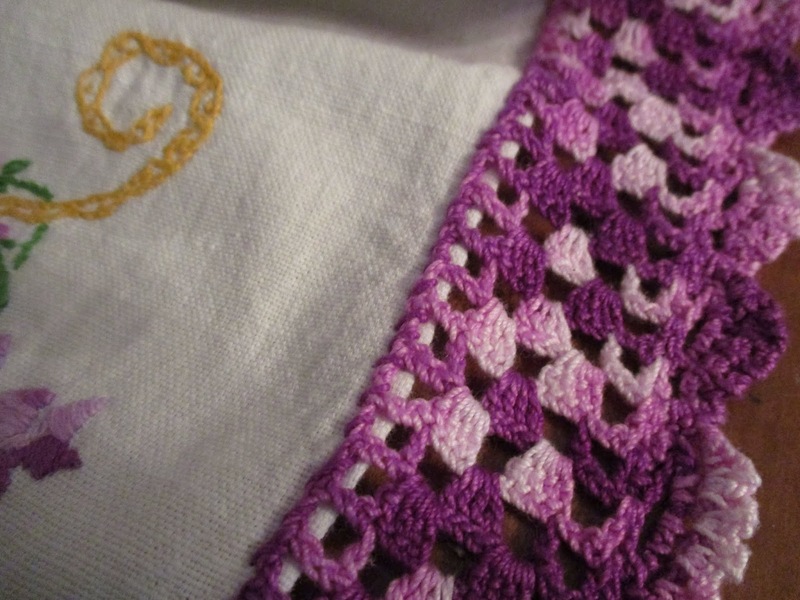 Since I crochet, I know how much work went into this trim. And I love how these thick old linens have such a loose, floppy quality to them, as though they've been loved by many others before me. 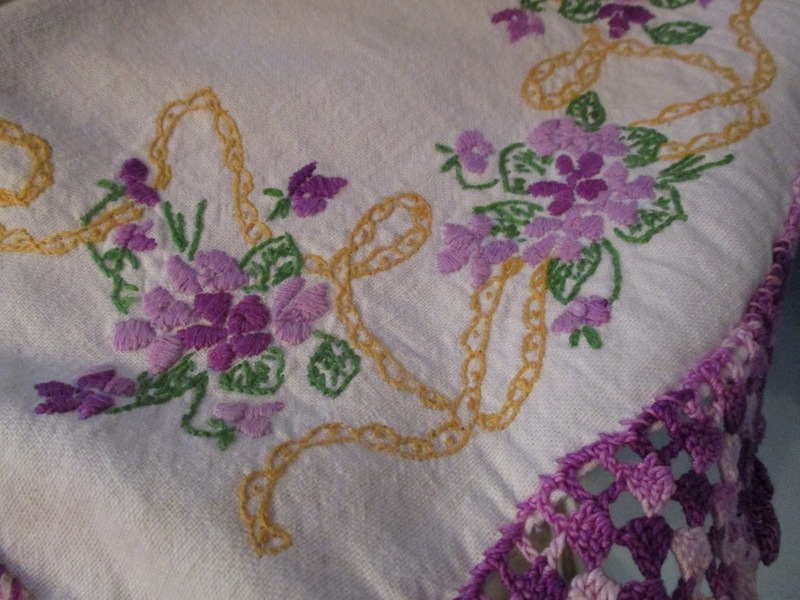 And while I admire precise stitching and embroidery (my inner perfectionist gets so frustrated when I can't achieve that myself), I am somehow charmed by the crude quality of these lavender, purple, yellow, and green stitches. The effect is still just lovely. 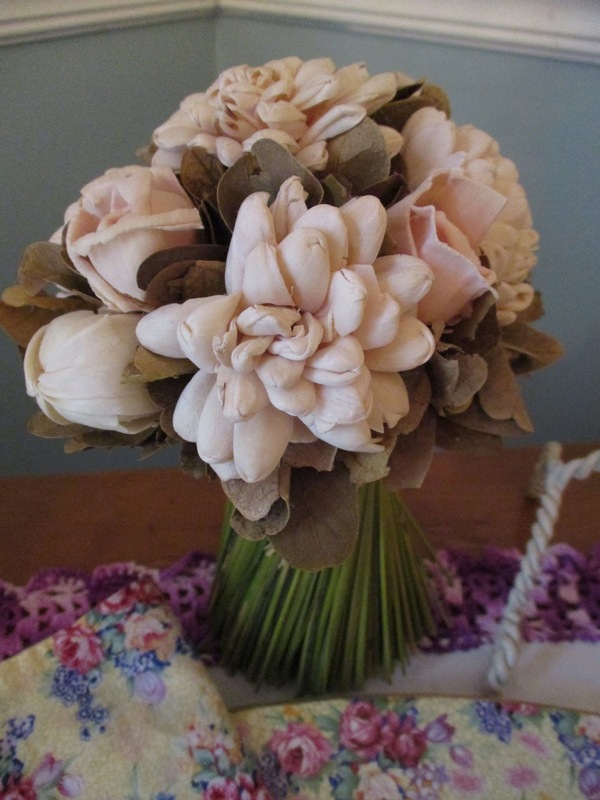 Also in the display: a few faux flowers . And since I'm going with a yellow-and-purple theme, I thought this teacup deserved a spot of honor. 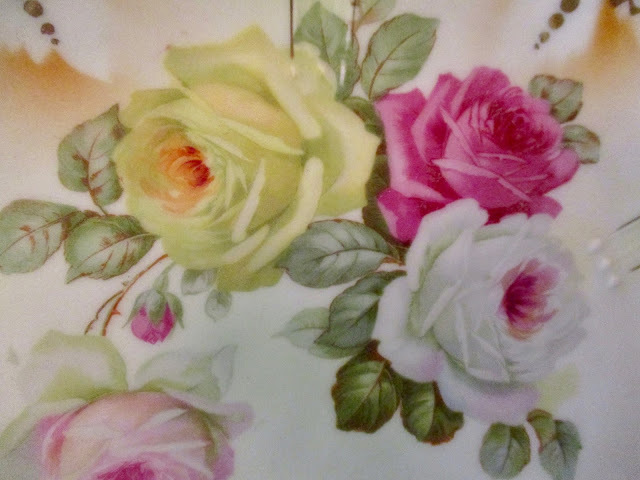 A detail from a yellow rose plate. 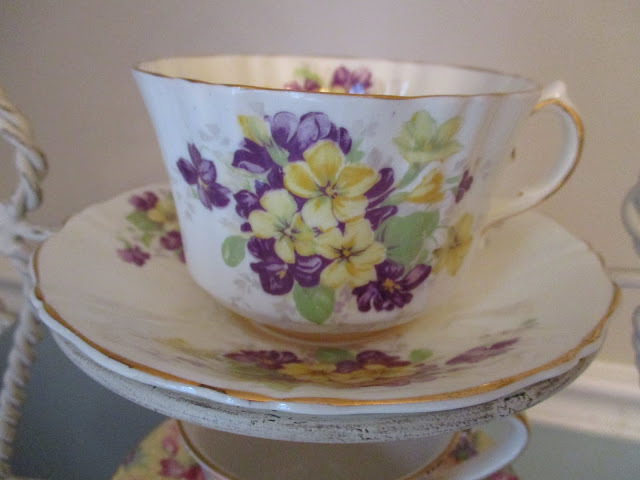 And here's what I'll be sipping out of this week! 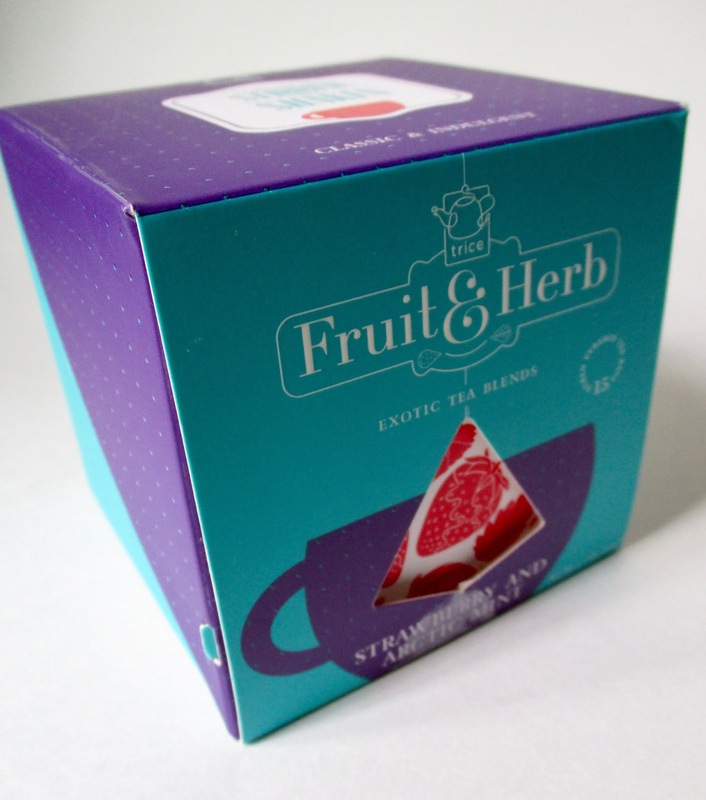 Spring is a time when I want to try some new fruity teas, and this herbal blend caught my eye when I was at T.J. Maxx earlier this week. 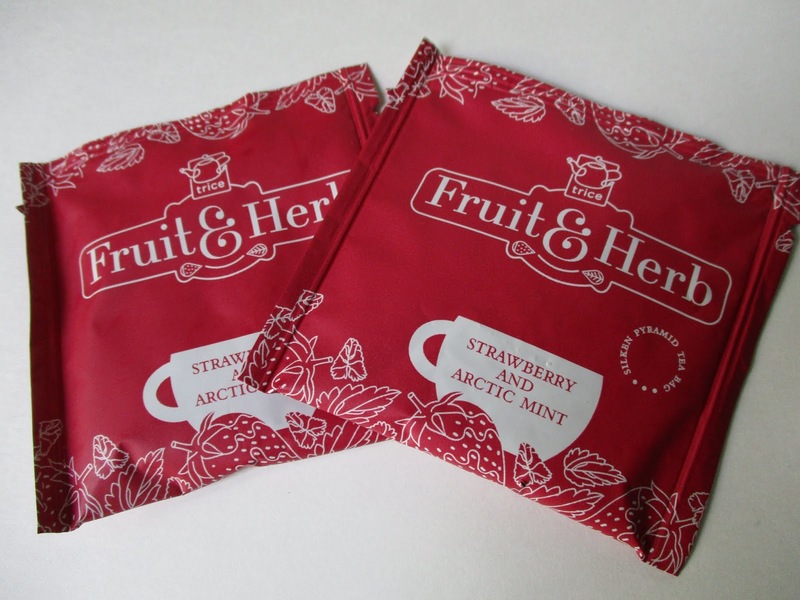 It's from Trice, a company I don't believe I've heard of before, and it's their Strawberry and Arctic Mint flavor. The attractive turquoise box with the nice teacup graphic struck me as really unusual, and when I got it home, it took me a bit to figure out how it opened! I was pleasantly surprised to find individually packaged tea bags inside. Nice! 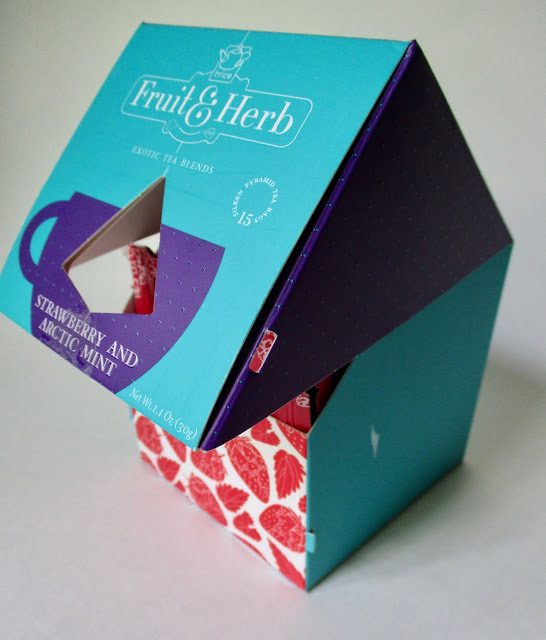 The tea contains rosehip, mint leaves, hibiscus, blueberry, raspberry, strawberry, orange flower, pomegranate bits and natural flavoring. I had wondered what a blend of strawberry and mint would taste like, and I found it deliciously intriguing. 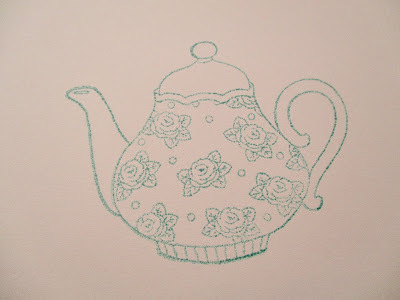 The tea wasn't tart, as some berry-flavored teas are, but it wasn't overly minty either. I'm not sure I'd have thought of combining these two flavors, but I'm impressed and very happy I tried this blend. Have you ever heard of Trice tea or tried this blend or any of their others? Last week, my friend Ruth asked if I had time for lunch this week, and I knew she was off on Tuesdays, so I said sure and agreed to meet her for lunch at Zoes Kitchen in Peachtree City, a local favorite. 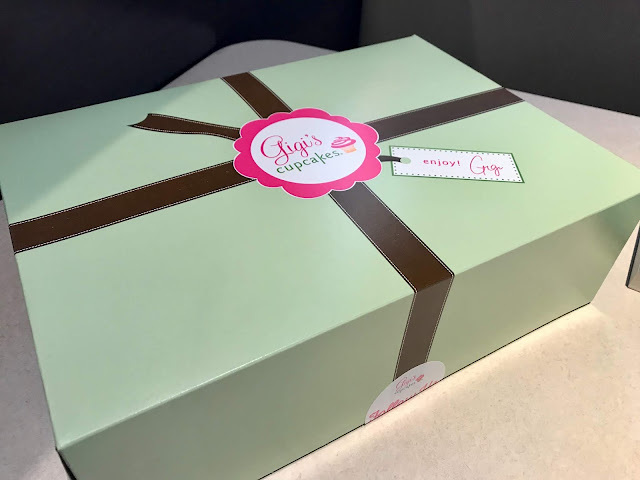 When I got there, she had this huge box from Gigi's Cupcakes, which makes some of the most delicious cupcakes I've ever eaten. "What's that?" I asked, pointing at the box since I knew I couldn't even pretend not to notice it. 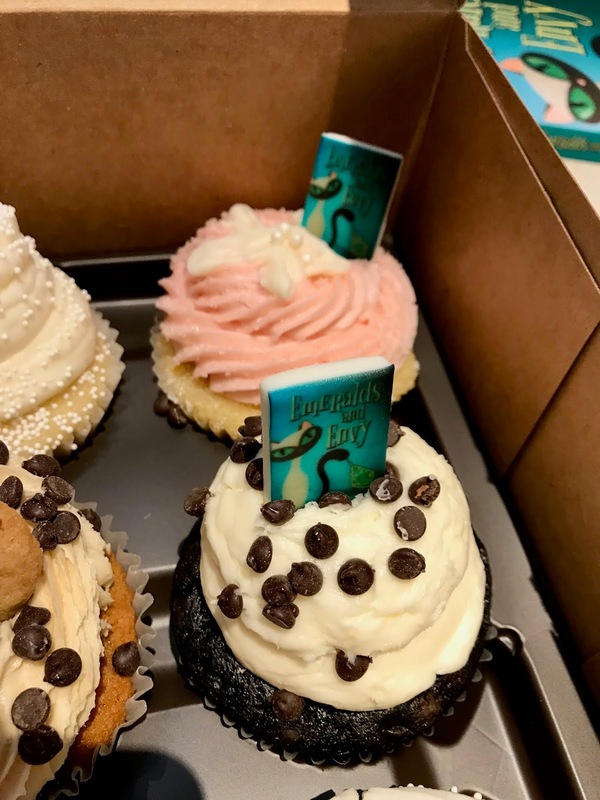 "It's for you," she said, "from the book club." (That would be our online book group, the Page Turners Book Club, which reads a book together and discusses it monthly.) 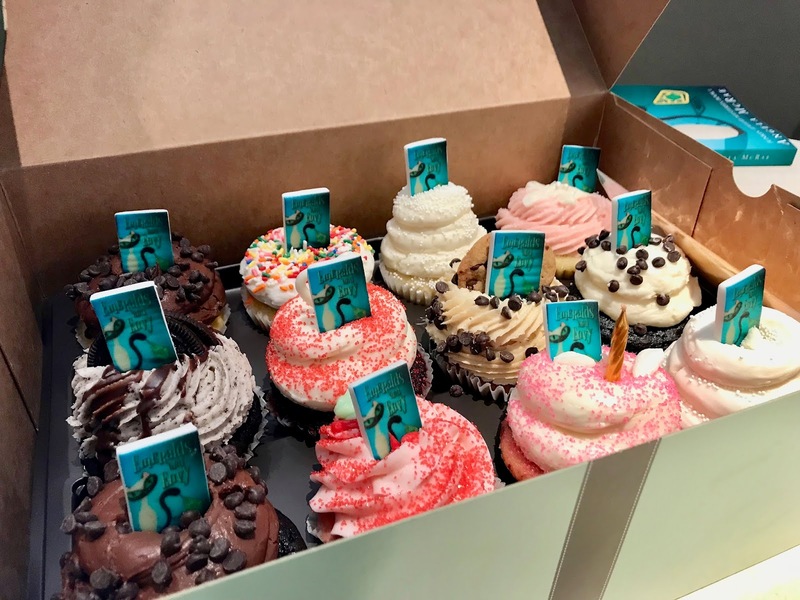 I knew they had been quite encouraging about the official launch day for my book yesterday, but I hadn't realized they were up to anything. While Ruth and I were waiting on our lunches to be delivered, she told me to open the box because everyone wanted to see the cupcakes and she needed to take a photo of them. And when I opened the lid and saw what was inside, well, "delighted" is the only word to describe how I felt! 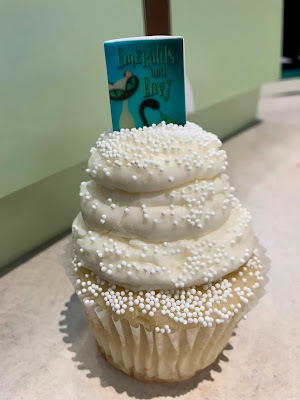 I couldn't believe they had gone to the trouble to have these cupcakes and fondant toppers made just for me, but they did. Aren't these the cutest things? I insisted Ruth join me for dessert there at the restaurant, and we sampled the Wedding Cake cupcakes, which she reported are the top-selling cupcakes for the local Gigi's. Mine was delicious … and so filling that I skipped supper, which I do not regret one bit! Frances L.! And I've just emailed Frances so I can see about getting this book in the mail to her. Congrats! 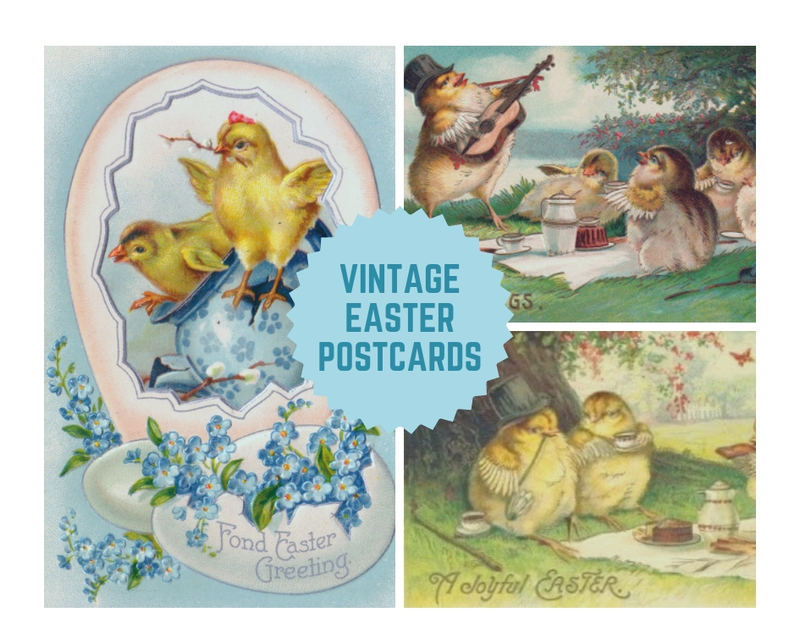 So now that I'm looking for new vintage Easter postcards, I've had fun looking back over some of the ones I've acquired over the years. 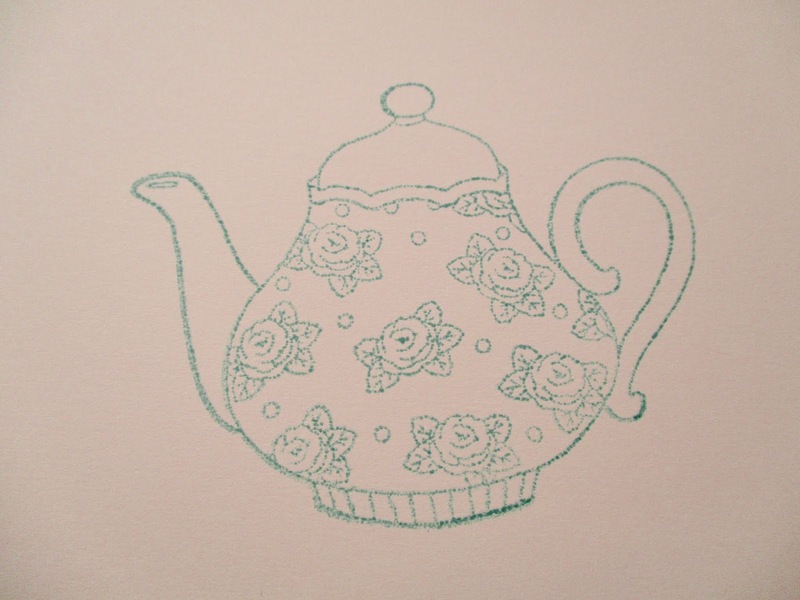 Little yellow chicks seem to be the main theme, and that blue teapot shows up in quite a few designs as well. I like to look at my postcards, and I also like to decorate with them, putting some in frames to keep out on display. 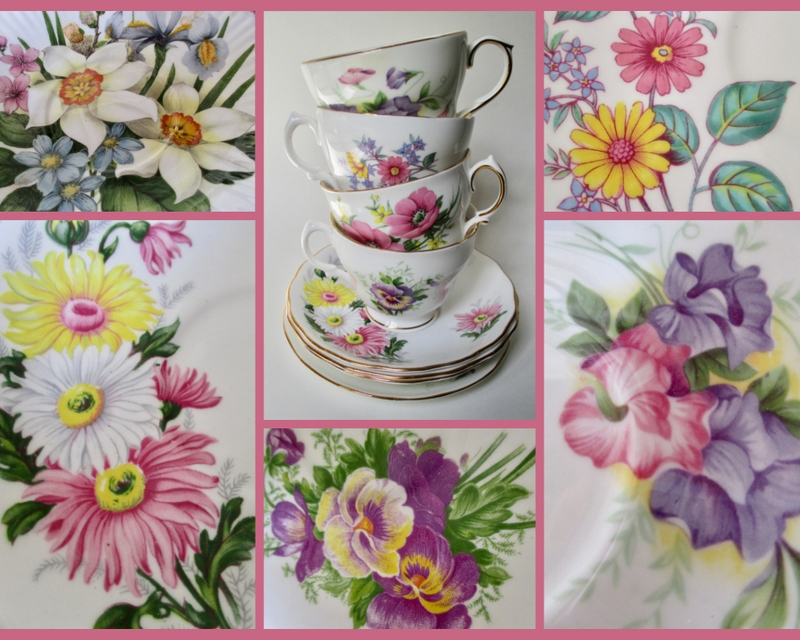 Vintage postcards are simply miniature works of art to me, and they're quite affordable, as art goes! 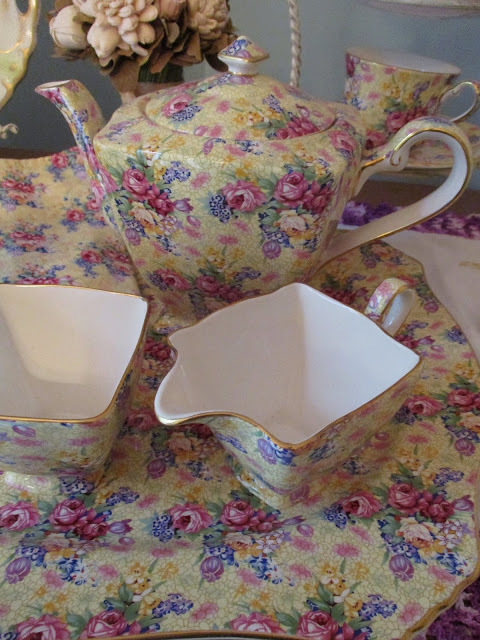 I've seen that a few tea friends are decorating for spring with violet-patterned tea wares, a look I love, and at my house, I find myself pulling out anything that has a sunny yellow or pastel flower on it. 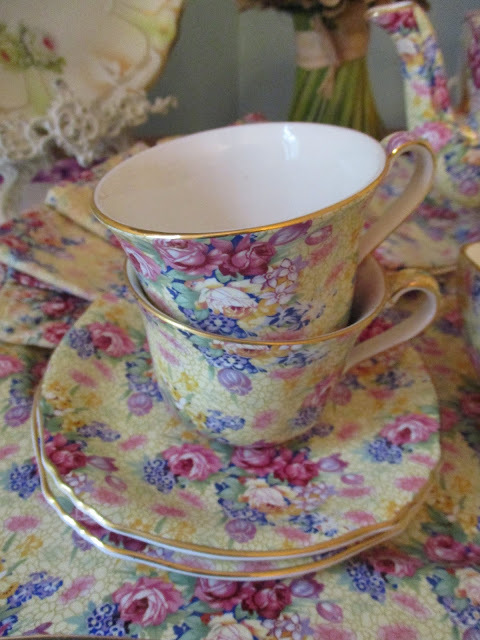 Do you have spring decor or tea wares out at your house? I'd love to know! So I wanted to steep a cup of this Organic Huang Shan Mao Feng Green Tea from TeaVivre, but I had a problem in that my basket-style tea infuser was too small for the mug I wanted to use. Hmm, I wondered. Could I just stick a spoon in there and keep the basket from sinking to the bottom of the mug? Yes. Yes, I could. The tea, by the way, is terrific (one of those rich, brothy-tasting green teas), but I was just so tickled to find such an easy solution to a too-small infuser basket. Have a tea hack you'd like to share? I'd love to hear it! 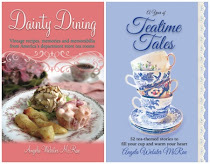 And if any other bloggers who review books would like to review it, just let me know and I'll be glad to send you an early MOBI, EPUB, or PDF file from my publisher. Thanks! 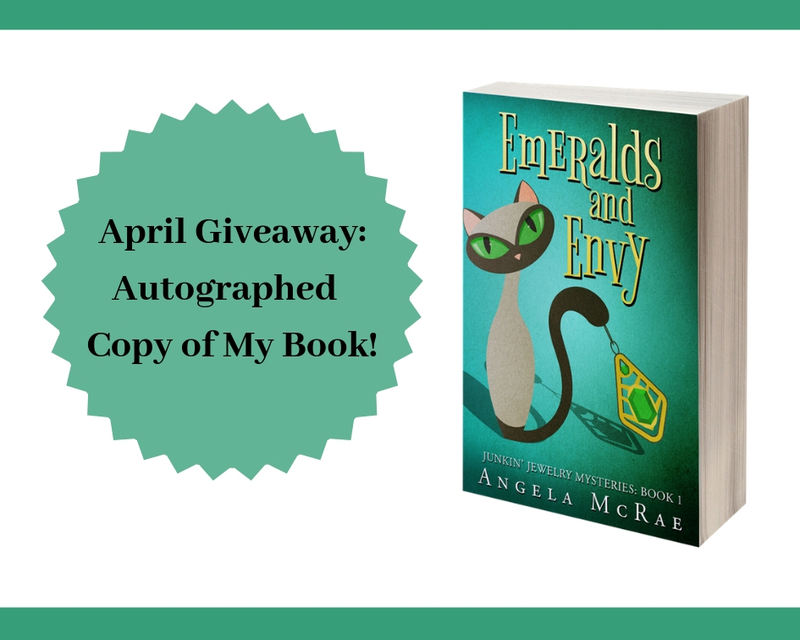 April Giveaway: A signed copy of "Emeralds and Envy"
Now here is a giveaway I've been eager to announce, because it's for one of the very first Advance Reader Copies (or ARCs) of my newest book, Emeralds and Envy. 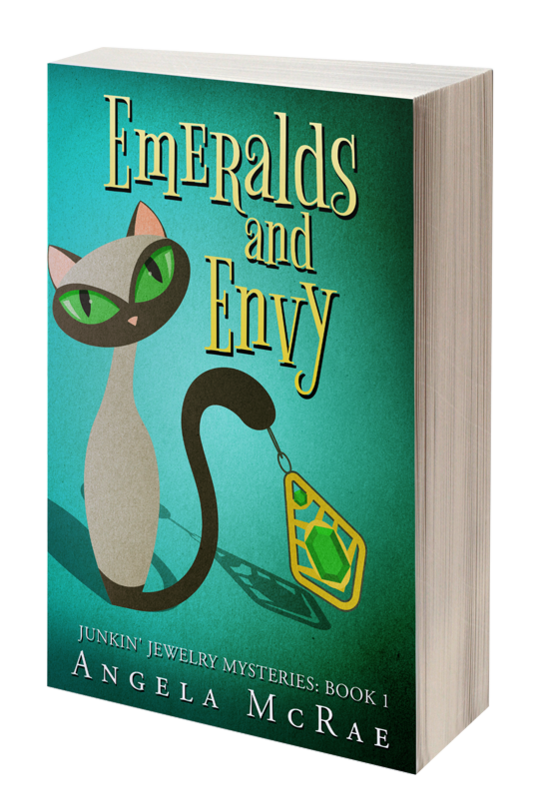 So for the April giveaway, I'll be delighted to sign this book for one of you and get it headed your way! If you would like to win a copy, simply leave an "Enter me" to this post between now and 7 a.m. EST on Friday, April 12, making sure I have an email address or other way to contact you if you're the winner, and you'll be entered to win. US only, please. Good luck! 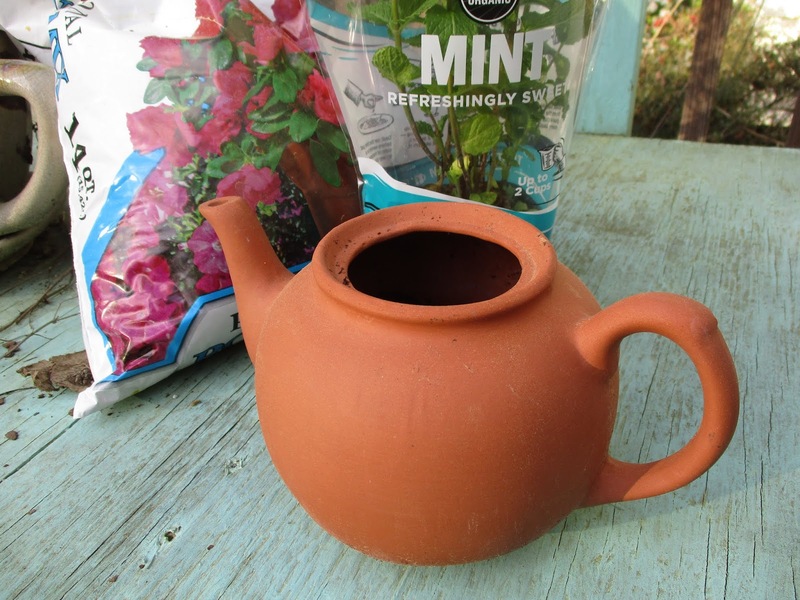 Fridays are always a great time to begin thinking about weekend projects, and if it's not raining all weekend, I hope to tidy up the flower beds in front of my house. If it rains, maybe I'll just kick back with a whole pot of tea and keep lusting over the pages of this charming new book, She Sheds Style by Erika Kotite. 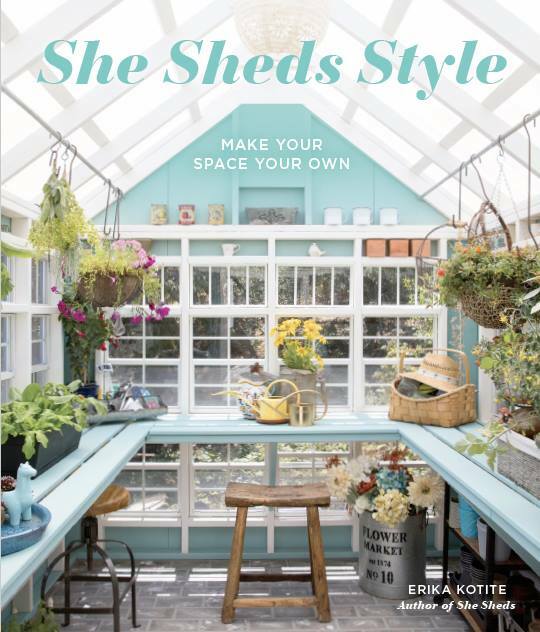 She is a past editor of Romantic Homes magazine (one of my favorite editors they've had), and I love her approach to sharing these eclectic she sheds and the women who've built and decorated them. 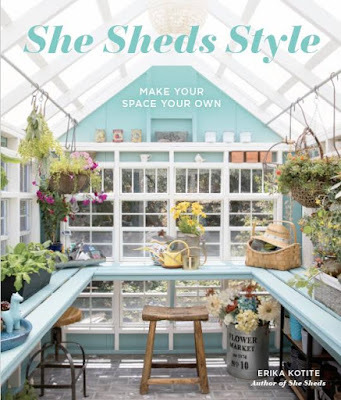 I still haven't decided whether I'd prefer a she shed or a vintage camper, but I do know that I want my one-day retreat to be multipurpose: it will need to serve as a writing cottage, a garden shed, and a tea house! It's rather a fanciful dream of mine, but you know what? I believe dreams are fine things to have. In fact, my friend LaTina gave me a pretty journal earlier this year, and I am using it to write down some of my dreams, including getting either a she shed or a camper. I love all the photos in the book, but this tiny house in the Catskills absolutely takes the cake! Friends, since I have an ebook coming out soon, I'm now officially an author on BookBub, which is quite exciting. Do any of you subscribe to BookBub? It's a free service I've used for several years to help me keep up with authors I like, and my fondest hope is that now, I'll be an author that someone else likes! 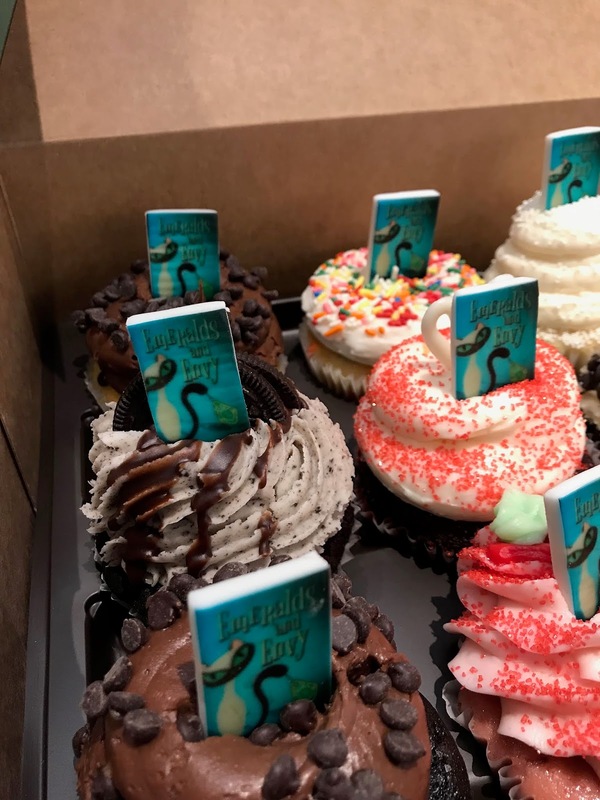 If you read ebooks, BookBub will help you discover books you'll love and even get updates from your favorite authors, generally just when they have a new release or when their book is offered at a steep discount. The service is free to use, and if you're a fellow BookBub enthusiast, I'd love for you to click that red button on the right and follow me. 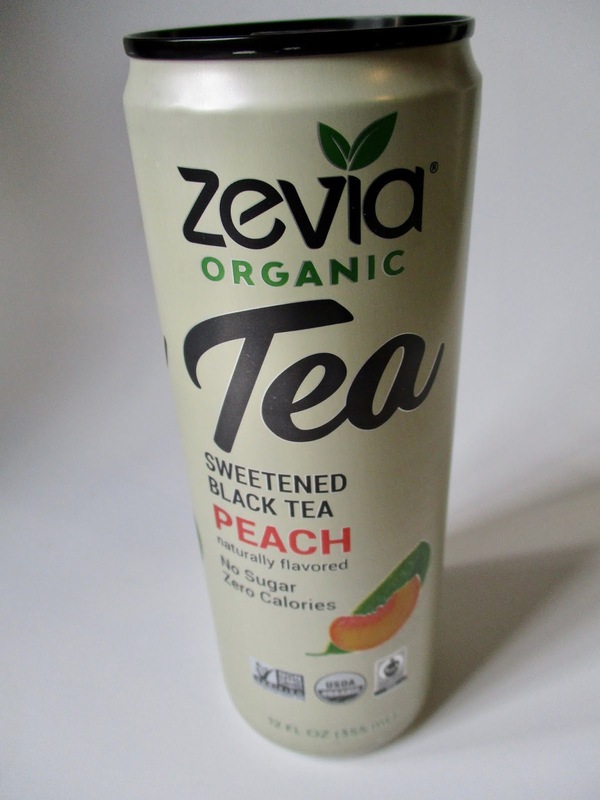 A trip by the tea aisle at Ingles over the weekend revealed that there are several new ready-to-drink (RTD) teas on the market, and I grabbed the one that most appealed to me, this skinny can of peach-flavored black tea from Zevia, a new name in tea to me. "No sugar, zero calories," it says. 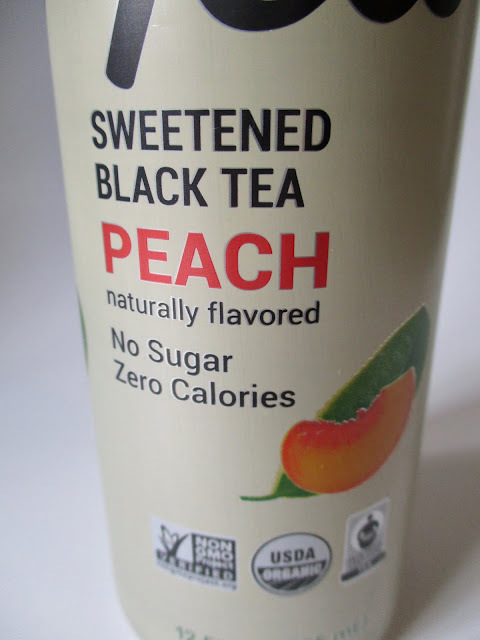 Well, that's good, but what about the peach flavor? I was delighted to find that the tea did indeed taste like juicy peaches, so I was quite happy with the flavor and will buy this tea again. And as is clearly hinted at in the company name, the sweetener is stevia leaf extract. I remember when a friend first told me about the stevia plant years ago, and today I find stevia in more and more products. 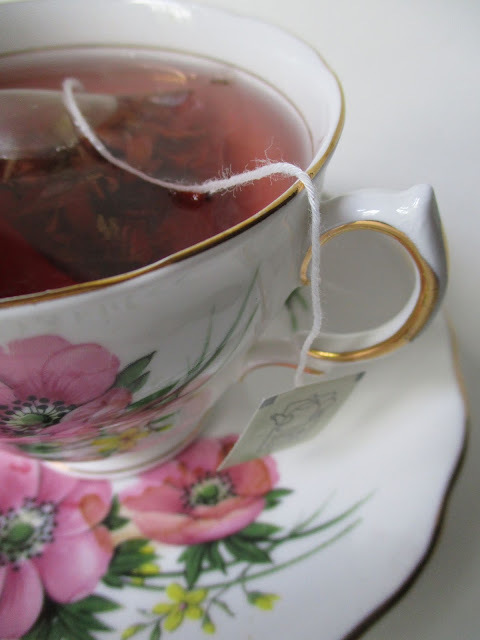 I don't actually require sweetener very often since I've learned to enjoy my teas au naturel, but for a bit of sweetness, stevia seems like a smart way to go, and I was happy to find it in this tasty new tea. 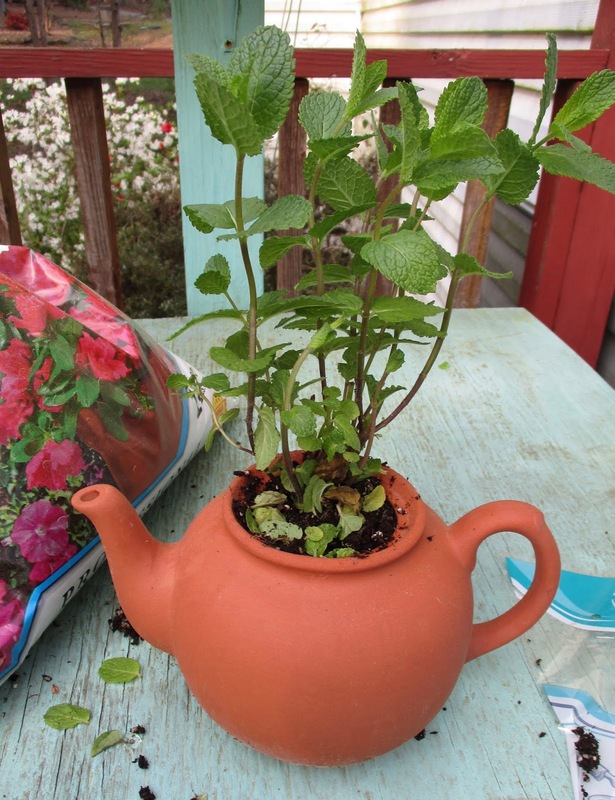 Are any of you stevia fans? So one of my weekend goals was to go ahead and get some mint growing for iced tea (it's supposed to hit 80 here in Georgia this week), but I didn't have time to run by any of the local garden centers. Fortunately, Ingles grocery store had a few mint plants in the produce section, so I tossed one in my cart. This mint doesn't say what variety it is, but I like all mints, so I'm sure I'll be happy with whatever it is. 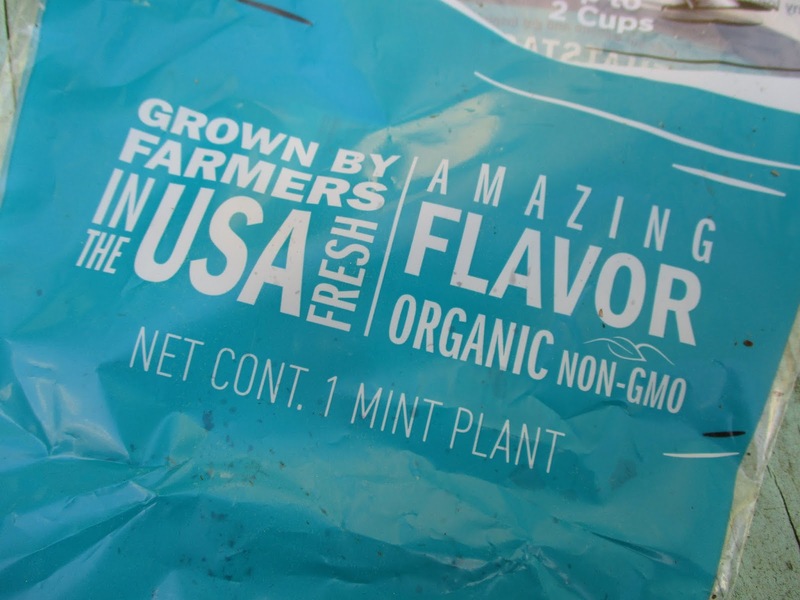 I also like that it's an organic plant that's grown in the US. 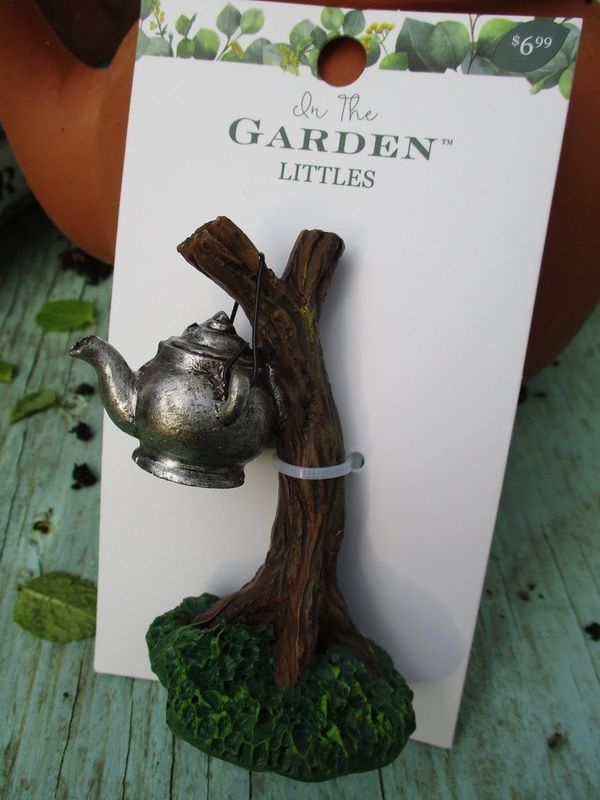 And while I'm not ready to plant a fairy garden just yet — my largest teacup planter has cracked and is going to need replacing first — I've started gathering items for the fairy garden, including the little teapot on a tree. Perfect, isn't it? It was on sale at JoAnn the other day for half off. 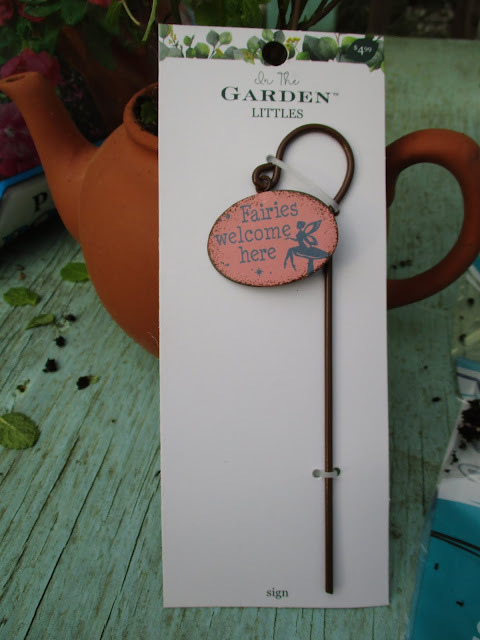 I also got a cute shepherd's hook marker to let the fairies know they're welcome. If you happen to run across any tea-themed doodads appropriate for a fairy garden this spring, would you kindly let me know where you saw them? If mine isn't completely planted by then, it will be nice to have a list of sources. 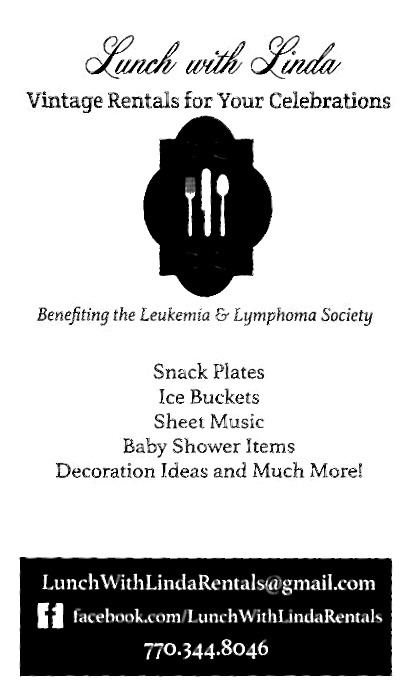 Thanks in advance, friends! Since it's Women's History Month, I find myself pondering the fact that it's been nearly 100 years since Congress passed the 19th Amendment granting women the right to vote. 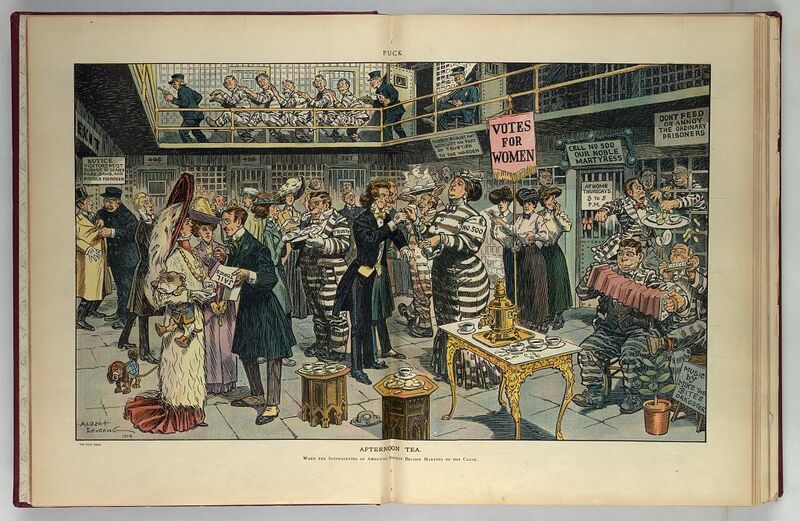 When I looked on the Library of Congress web site this week, I was intrigued by this pre-passage cartoon from 1910 that makes it clear "Votes for Women" weren't always taken seriously. If you look at the woman to the right of the book's middle, she has an arm band reading "No. 500." Behind her, at about the middle of the right-hand page, you see a sign that reads "Cell No. 500 Our Noble Martyress." 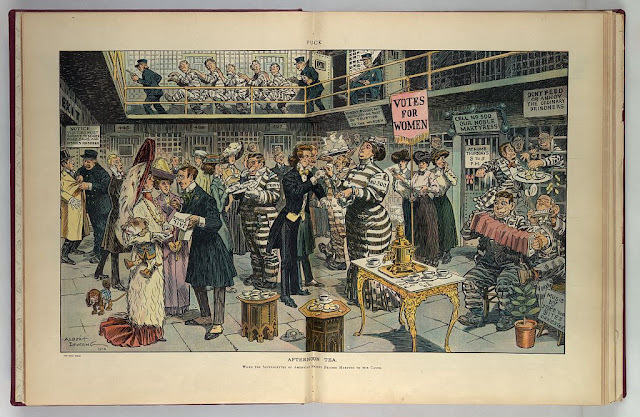 And the caption of this cartoon says, "Afternoon Tea — When the suffragettes of American society become martyrs to the cause." While goodness knows I'm not always pleased with the outcome of my voting, I'm definitely grateful for the right to vote. And I'm also grateful that a cartoon like this would simply earn ridicule today! I made my first macarons in 2012, having beginner's luck and finding success on my first attempt, and I was on a macaron kick for a while. 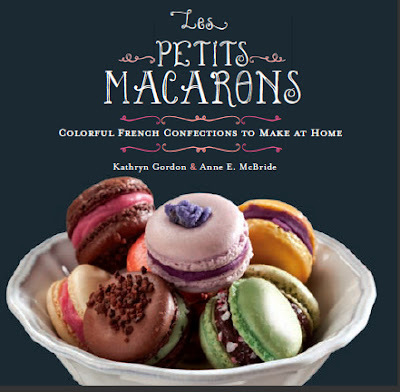 I bought magazines with macaron recipes, tried the macarons everywhere I saw them, and even bought a macaron cookbook. 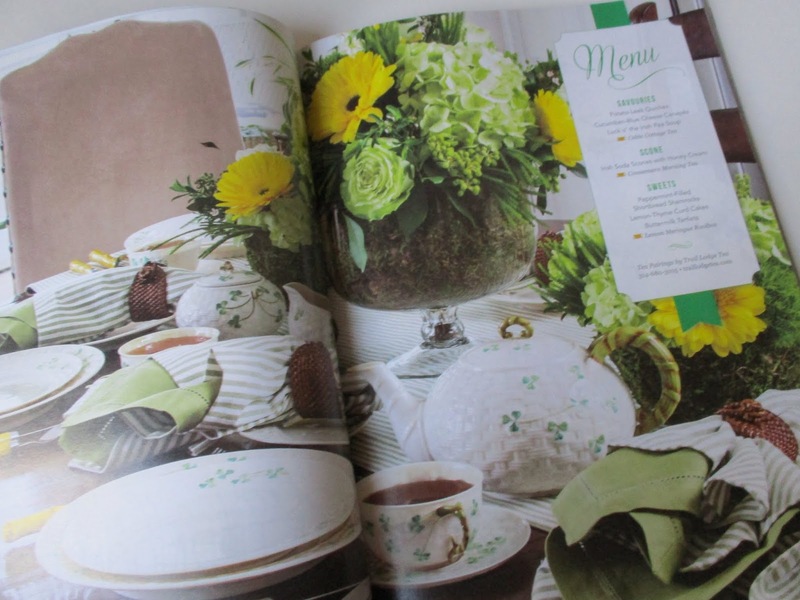 Then my interest waned, and when I saw this pretty cookbook that had come out at about the same time, I decided I didn't need it. But when the Salvation Army in Carrollton had their 5-for-$1 book sale, I quickly decided that 20¢ was not too much to pay to check out a mint-condition copy of Les Petits Macarons. Since I haven't made (or eaten) macarons in a while, I'm practically drooling over all the offerings in this book, and I was surprised to find quite a few tea-flavored macaron recipes, including these flavors: green tea, green tea and white chocolate, chai, and lapsang souchong with whiskey (variation: Earl Grey). 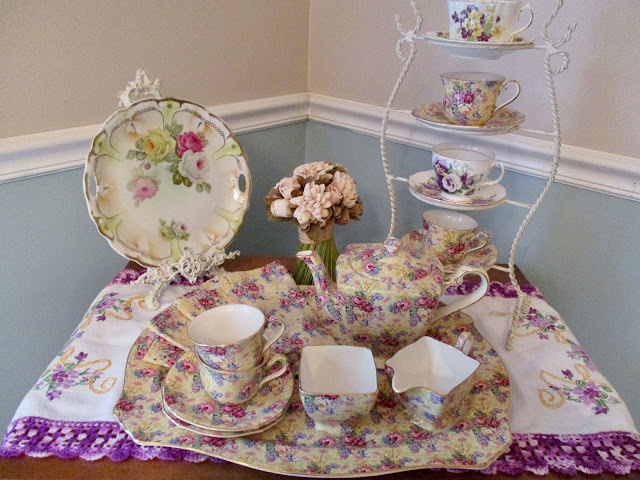 There are also some flavors I consider tea-related, such as chamomile and lemon curd. And in what I think is a super-smart move, authors Kathryn Gordon and Anne E. McBride offer tips on recipes you can make with any less-than-perfect macaron shells that you end up with, things like tarts and trifle. There's also a section on trouble-shooting tips, so even though I've had macaron-making luck in the past, I'm please to see tips on how to resolve any issues in the future! 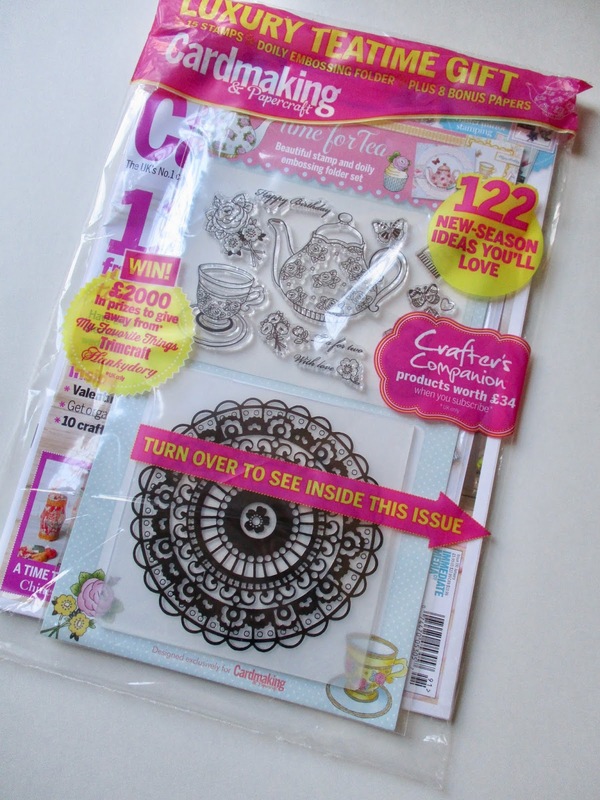 So along with that great new magazine about British Tea that I found at Barnes & Noble last week, I also splurged and got a new British craft magazine, Cardmaking & Papercraft. I wouldn't normally have spent $13.99 on a craft magazine, but I was using a Valentine's Day gift card from my husband, so I figured why not. What most caught my eye was this "Time for Tea" craft set, which included some clear stamps and a lace doily embossing folder. I studied the magazine for a few days and admired the designs inside, and finally over the weekend, I was ready to play with my new goodies. I pulled out my Cricut Cuttlebug machine and greatly enjoyed embossing the doily design on some pieces of white cardstock. I realized I now need some die cut circles so that I won't have to cut these out by hand, so that will go on my craft-supply wish list. The rubber stamps, I'm afraid, didn't just bowl me over. 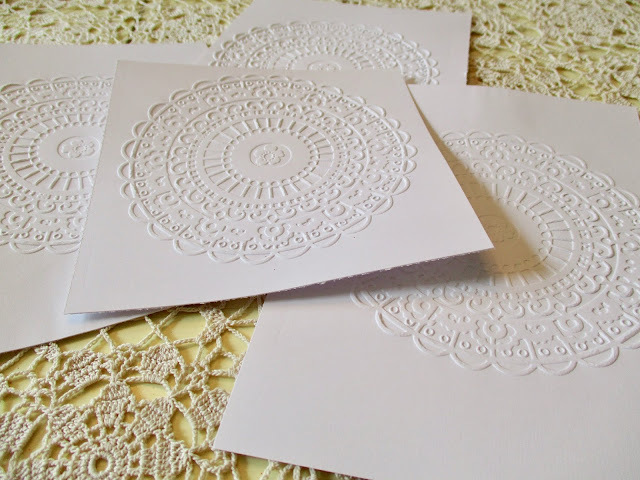 The design is a bit blurry, not like the crisp impressions I get with my Stampin' Up stamps, so I'm probably going to tuck these away, although I can tell I will use that lace doily embossing folder to make lots of doilies. 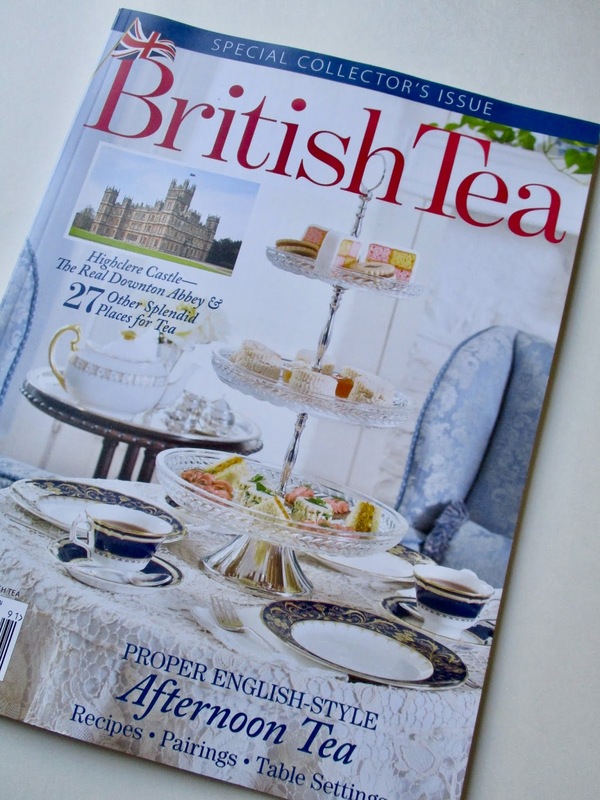 I'm still glad I got this magazine, though, as it has great ideas for tea-themed cards. 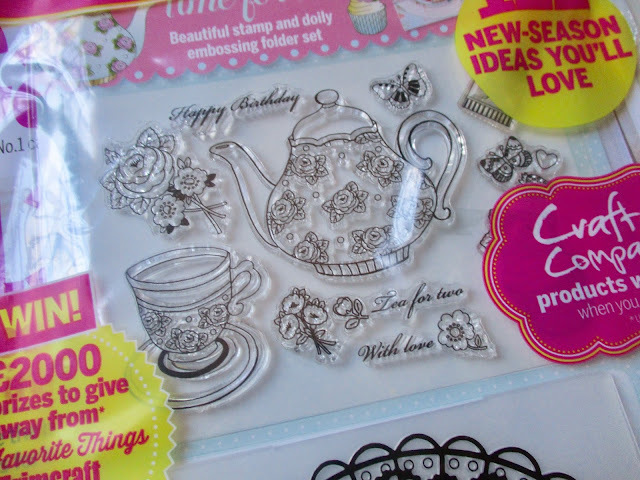 So for all of my papercrafting friends, you may (or may not) want to look for this on the newsstands. I love how British craft magazines usually lure us in by offering a gift with the magazine. Don't you wonder why US magazine publishers aren't trying this tactic as well? I wish Hoffman Media would stop coming out with so many special issues that tempt me, but alas, this one leapt into my hands while I was at Barnes & Noble earlier this week. I suppose the name of this title explains why, doesn't it? 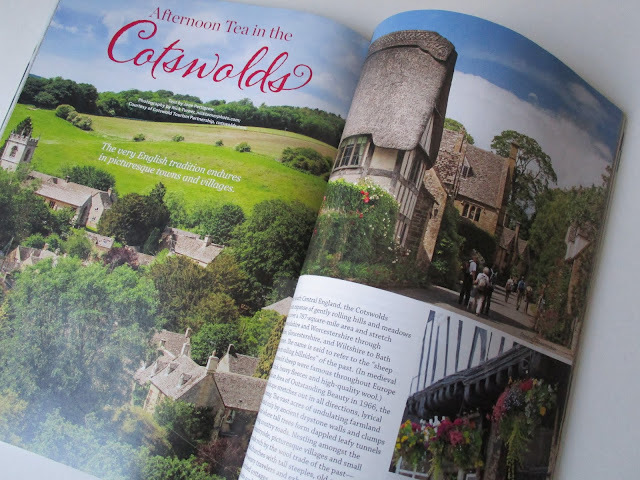 This issue has so many lovely travel photos, and since I've been to England but not to the Cotswolds, this feature has me longing to plan a trip so I can wander the streets of some quaint little village. 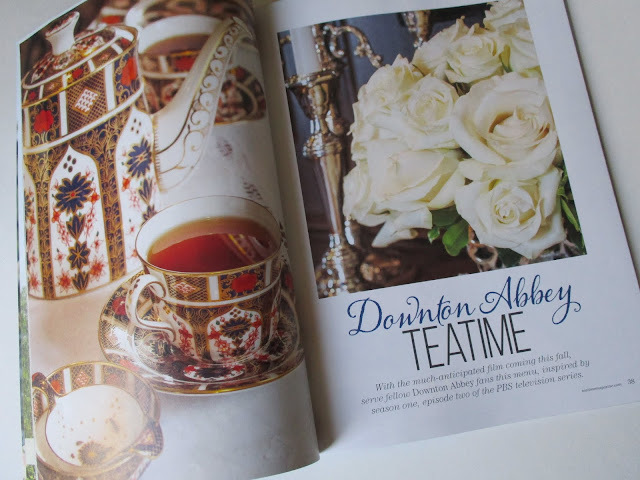 There's a very rich-looking tea service depicted in the article on a Downton Abbey teatime, and there's also a lovely spread on the real Downton Abbey. It reminded me that we fans have a DA movie to look forward to this September! I don't know about you, but my skin has gotten much drier as I've aged. And after being holed up in my office with a space heater all winter, and now, working out in the yard during evenings and weekends, my skin is parched. 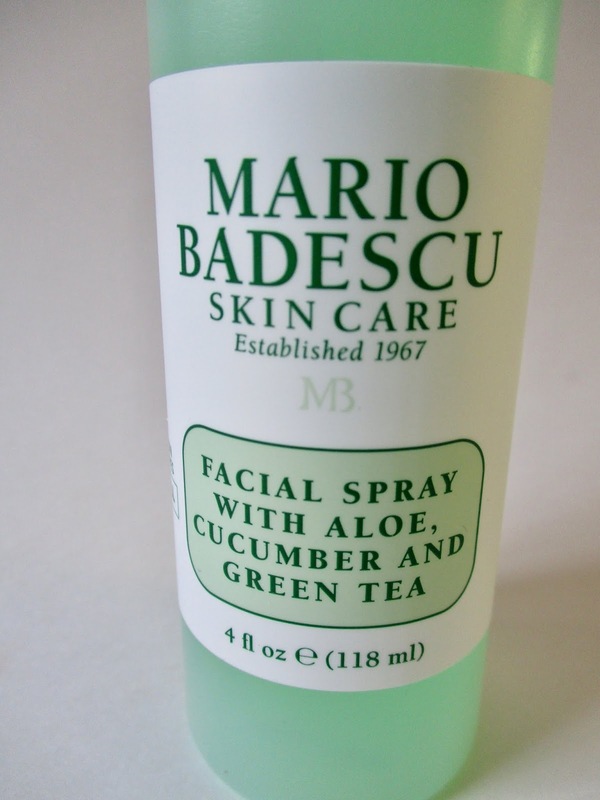 Helpfully, when I was at Nordstrom a few weeks ago, I picked up a product I'd been wanting to try, this Mario Badescu Skin Care Facial Spray with Aloe, Cucumber and Green Tea. 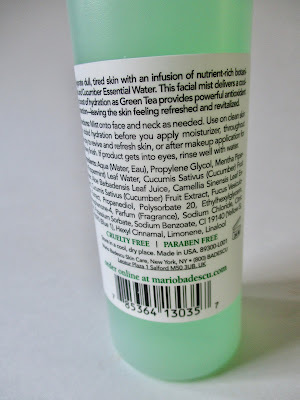 I'm a fan of all of these ingredients and decided to give this spray a whirl. While I've just started using it this week, I must say that I'm absolutely loving it. 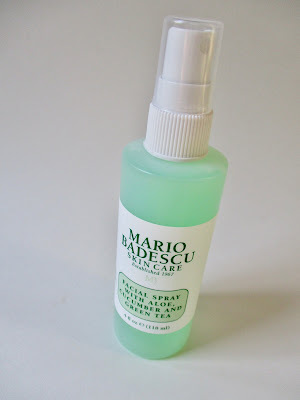 It sprays a light mist over my face and feels only lightly moisturizing. I can't stand a greasy product on my face, and this avoids that feeling completely. 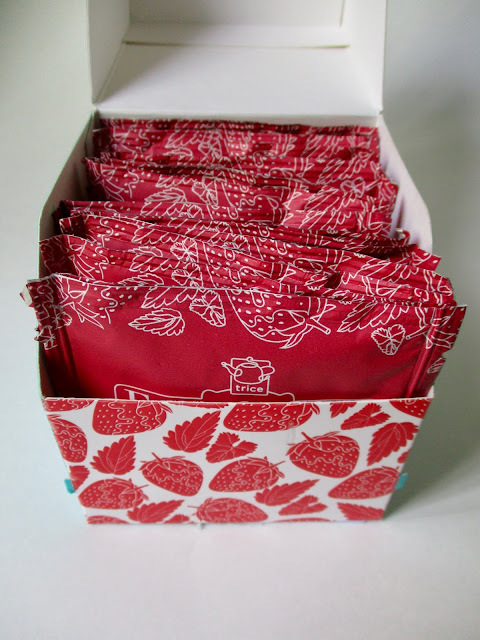 Plus, it has a light, refreshing fragrance that makes it even more enjoyable to use. 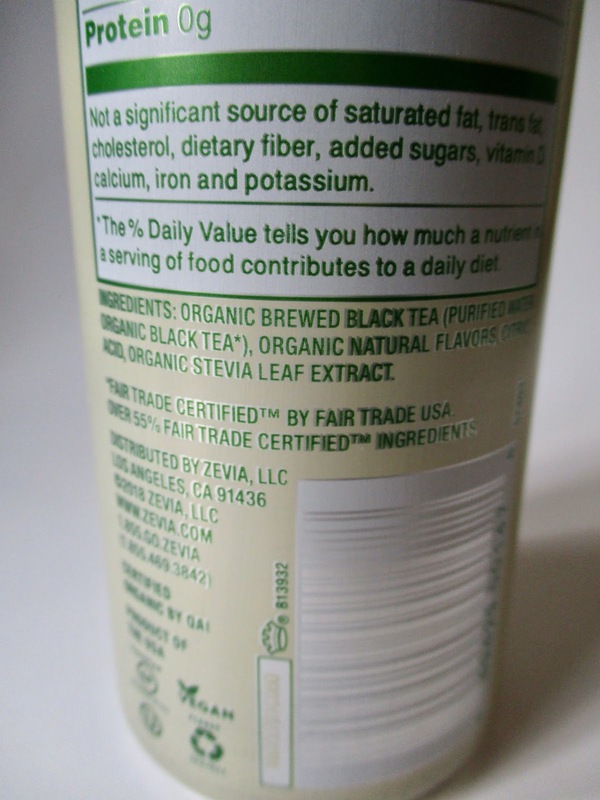 And yes, it does indeed contain camellia sinensis leaf extract, so there's that. The big surprise to me was that the four-ounce size of this facial spray is only $7. 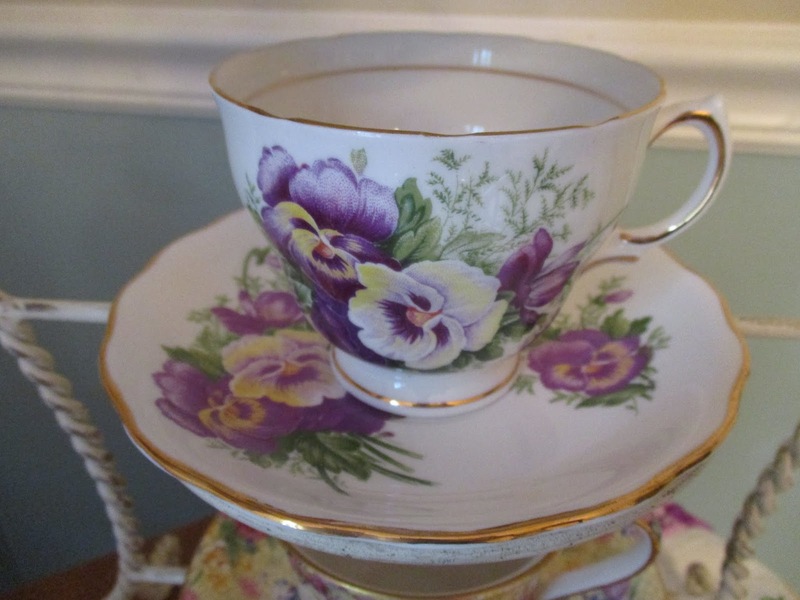 And at the Phipps Plaza Nordstrom the other day, I experienced the kind of customer service that reminded me that yes, only the great department stores still deliver this sort of experience. I was shuffling several bags around, as well as the remaining half of my lunch from their restaurant. 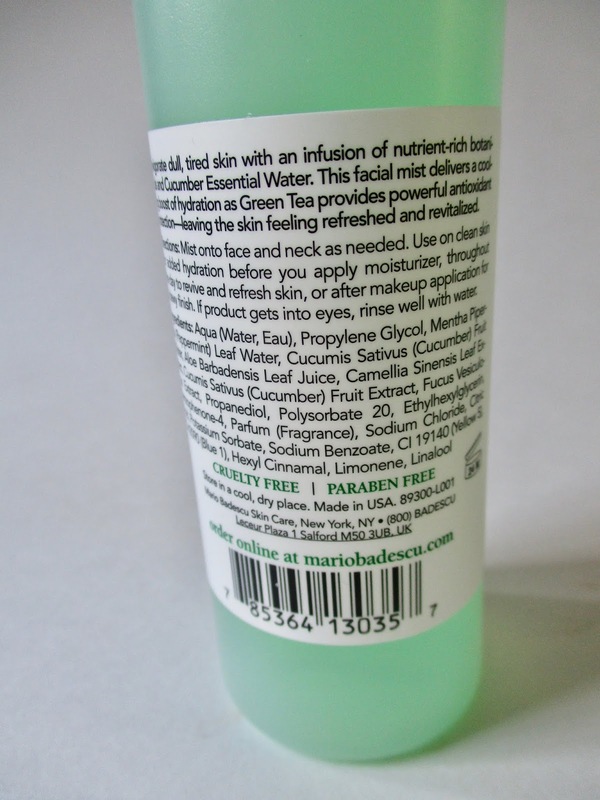 The salesclerk thoughtfully offered to give me a large bag to hold all of my smaller bags, and she also told me that since I live an hour away from the store, I could feel free to call her up if I want to re-order this facial spray—with free shipping. So I spent $7 in her department, and she treated me like a queen. Imagine that! So if you want to try this spray yourself, I would recommend you look here. 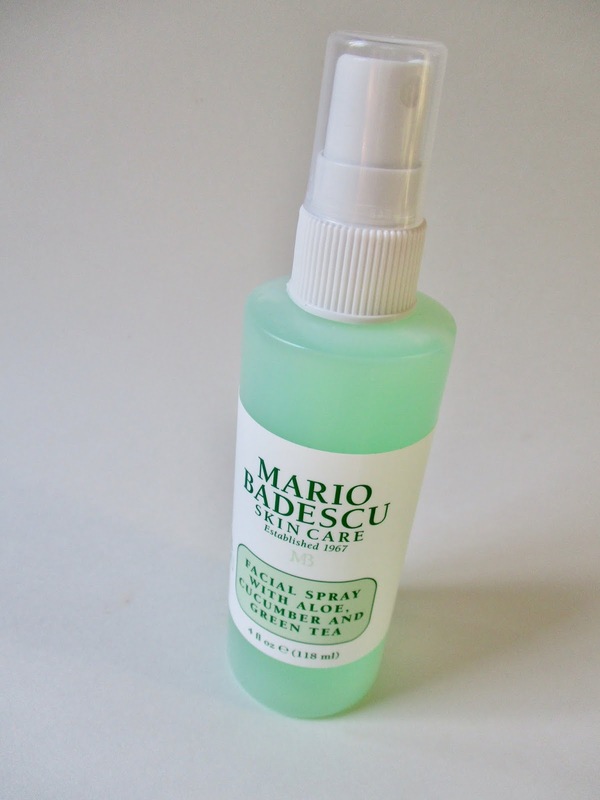 Have any of you tried this Mario Badescu facial spray before? If so, what did you think?